Are you tired of seeing ants in your dry goods? Are you always having to track down every grain of dropped sugar in hopes a visiting sugar ant does not find it? Are you annoyed with those pesky carpenter ants chewing on your home’s interior? Are you still battling those terrible fire ants every time you mow the lawn or tend the garden? Unlike many brands of commercial ant repellents, natural ant repellents can help get rid of your ant infestation without exposing your children and pets to toxic poisons. How Does Natural Repellent for Ants Work? Are Natural Ant Repellents Safe to Use Around Pets and Children? How Do You Use Natural Ant Repellent? Another benefit of using natural ant repellent indoors and outdoors is the money you can save. Many commercial ant repellents often either do not work well, are expensive, and only give you a small supply per bag. Natural ways to get rid of ants cover more ground and reduce your ant infestation faster. But what makes natural repellents better than commercial ant repellent? It is all in the list of ingredients. Each of these poisons has a toxic effect on humans and animals. Some components are carcinogenic such as fipronil and fenoxycarb. If you are ever unsure about what ingredients your pesticide has, you can always check various websites about potential hazards. There are numerous natural ways to get rid of ants that can be used to deter mosquitoes too! For pet owners, pest control is not the only issue. Many pet owners have to worry about keeping ants out of dog or cat food bowl without throwing the food away or hurting their pets. Ants have a strong dislike for things smelling of peppermint. This recipe is excellent for people who have pets and children since the essential oil is harmless. Fill the container with the peppermint essential oil. Then add enough water to fill the spray bottle. Shake well and spray all areas where you have found ants. Re-apply the spray every so often to keep the ants away. Citrus smells do not appeal to the ant’s senses. If you ever wondered what to do about your collection of citrus peels, then you can now reuse them for ant repellent. Save all citrus peels (orange, lime, lemon, and grapefruit). Once you have enough citrus peels, you can ground them in a medium-sized bowl. Store the ground up skins in a sealed container. For a natural ant repellent indoors and out, spread the peels near your windows, doorways, in your garden, and any potted plants. Clean up any peels that are exposed to water or are molding. We have all seen what a baking soda and vinegar reaction can do when unclogging drains. This simple trick also works against ants and is harmless. Pour the white vinegar into the spray bottle. Locate all ant piles and spread it around the ant mound until there is a nice thin layer of baking soda on top. Spray the vinegar on top of the ant mound until a foaming reaction occurs. Repeat these steps for other ant colonies. Ants have a strong dislike for soap and oil combinations. This recipe gives you a beautiful floor cleaner and ant repellent in one! Combine the essential oils and soap into a bucket. Add hot water and apply the mixture on your floors. You can use the mix on your window sills and doorways too. Make a new batch each time you need it to ensure the potency of the oils. Ants love all things sweet and sugary. This recipe is also effective against cockroaches. Combine the Borax with the powdered sugar in a small bowl. Spread the mixture around the areas where you have found ants. Keep this mixture from children and pets. If you are looking for a bonus to those citrus peels, try this natural mixture to ward off ants and other insects. Nothing says “stay out” like the intense smell of white vinegar! Pour equal parts lemon juice and vinegar into a spray bottle. Shake well before spraying areas where you have found ants. This recipe is safe to use around pets and children. Sometimes you want to spray your whole house to keep those ants out. Not everyone likes the smell of lemons and vinegar, which makes this recipe an excellent repellent alternative. Combine the water, vodka, cinnamon essential oil and peppermint essential oil into the spray bottle. Shake the bottle and spray. You can safely use this spray indoors and out. Borax and boric acid, while useful, are not recommended for use around pets and children. For a safe indoor solution to your ant problem, use baking soda instead. Mix baking soda and powdered sugar in a bowl. Sprinkle the mixture around the areas where you have found ants in your home. The ants will take the sugar and baking soda back to their anthill and die because of ingesting the baking soda instead of the sugar. Food-grade diatomaceous earth is a natural silica-based powder. 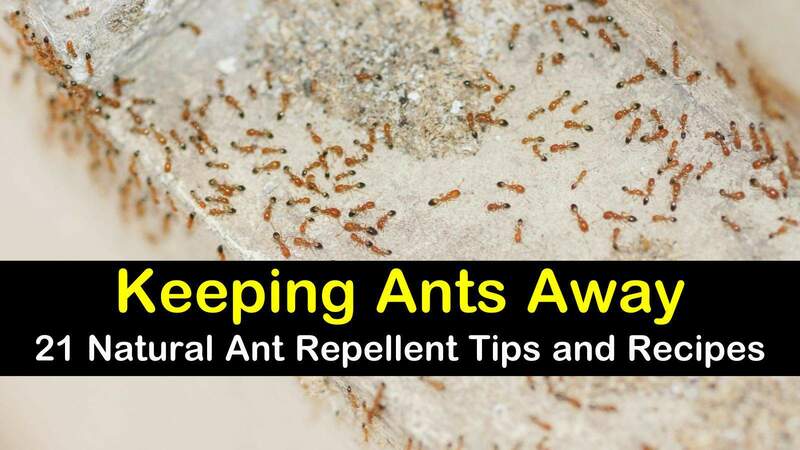 Use the repellent indoors and outdoors to get rid of ants and many other pests. Spread the dust where you have an ant problem. Hot water kills weeds and plants and will also get rid of your ant problem. Boil water and pour it directly on any ant colonies. Keep children and pets away to prevent any accidental burns. Spices are a great way to keep ants out and freshen up your home. Just place a stick of cinnamon in your pantry, cabinets, and near window sills. Should the cinnamon get wet and moldy, switch it out for a new one. Ever wondered what to do about these coffee grounds every morning? Well, you can spread them around outside and in your potted plants to help keep the ants away. Sprinkle the grounds around the exterior of your home and near all entryways, too. If you are looking for a way to keep ants out of your pet’s bowl or away from your bird feeders, add some cornmeal. Lightly sprinkle the cornmeal around the pet dish, bird feeder, and other areas where you don’t want ants. Reapply the cornmeal every few days or after rain. Ants are mother nature’s garbage disposals. If you want to keep ants away from your home, garden, and shed, then you should keep your bushes trimmed. You will need to keep your garbage cans clean and gardens cleared of debris. Move your piles of compost and wood away from your home. This will also help to deter mosquitoes. Growing flowers and produce can be a very relaxing experience until the ants show up. Give those ants the boot by planting tansy flowers in your garden. Use the dried version of tansy inside your home to keep ants out. Ants can get into homes in many ways. One way is through the thin cracks near your pipes. Keep all areas around your pipes adequately sealed and covered to prevent ants from entering and exiting your home. Ants have an odd relationship with chalk – they refuse to cross it. Take chalk and draw around all entryways into your home, windowsills, and anywhere else you do not want ants. If you have leftover bay leaves, use them in your cabinets, drawers, pantry and around window sills, or anywhere else you want to keep ants out. Ants dislike the smell of bay leaves and will avoid areas with them. Like cornmeal, Cream of Wheat is another product you can use to deter ants. Ants will eat the Cream of Wheat. Once the ant eats it, the insect will die because of the wheat expanding in their abdomen. It is a safe alternative to vinegar and other substances around the home. Get cotton balls and add one or two drops of peppermint essential oil per cotton ball. Place the cotton balls inside areas where you have found ants. If you do not want to waste food, baby powder is another useful tool against ants. Apply it anywhere you need it in the yard or garden or inside your home. A natural repellent for ants works because of the non-toxic insect repellent ingredients and the strategic placement of these repellents. A combination of these recipes can also help combat your ant problems. Mostly, yes these recipes are safe. Borax and boric acid are the only ingredients that are not safe to use around pets and children. However, these two ingredients are natural and, if used with caution, can be useful tools against ants. For the best results, use these natural repellents in areas where you are finding the ants. Places to apply natural repellents for ants indoors are near windowsills, house plants, under kitchen cabinets and food pantry, and areas with water such as pipes, and doorways. Many of the listed natural repellent recipes work and will save you money, but they are not without their shortcomings. Like any other repellent, you will need to reapply it again, especially after it rains. Some ant repellents may not be wise to use around plants. Natural ant repellents can be messy and will require cleanup. Getting rid of your ant problem can seem like an uphill battle, but with these simple tips and recipes, you will get rid of those pesky ants for good. Natural ant repellents are a safer alternative to those toxic commercial pesticides and insecticides. These natural insect repellent recipes will save you money, time, health, spare your garden, and can help freshen up your home. 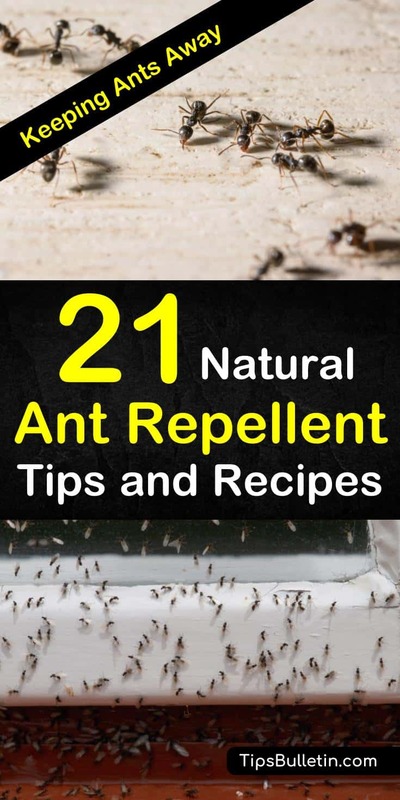 If you liked the ant repellent recipes or want to help out a friend with these pest control tips, then please spread the word by sharing this list!